Since Handa Island was adopted by the Royal Society for the Protection of Birds in 1962, it has become a mecca for British ornithologists and enthusiastic amateur birdwatchers. The island has the greatest concertation of seabirds in the north-west and at nesting time they are numbered in tens of thousands in a variety of species – guillemot, razorbill, kittiwake, fulmar, puffin, herring gull and shag – creating a deafening cacophony of noise. Falcons, buzzards and golden eagles are sometimes observed but these are occasional visitors. Sheer cliffs, 300-400 feet high, defend the island, relenting only where a breach permits landings to be made at a small beach; nearby an ancient graveyard and ruined crofts are relics of a former occupation. Today Handa is uninhabited except by birds and is in the care of a warden. An impressive feature of the cliffs is the Great Stack, a detached pinnacle of sandstone which, incredibly, has been ascended to its flat top by rock climbers. Access to the island is permitted and usually made by hired boat from Tarbet across the Sound of Handa; to avoid disappointment, visits should be prearranged. At Scourie, the road reaches the sea and again turns south, now in the close company of a very attractive coastal area, a labyrinth of inlets, bays, cliffs, promontories and lochans in a colourful and confusing array that must have sorely tested the surveyors and cartographers of the Ordinance Survey. A succession of delightful surprises comes into view as the journey proceeds, the gem being Badcall Bay and its seascape of a dozen off-shore islands and, beyond, the vast expanse of Eddrachillis Bay. The road between Scourie and Kylesku has been changed out of all recognition. It was formerly a narrow single-track with passing places throughout its eleven miles, a slow journey during which the motorist had to keep his foot on the brake and his eyes alert for oncoming cars. Today, however, it is a splendid two-track road, out of character with its surroundings but permitting fast progress – although few will fail to stop often to appraise the changing views around each bend. The scenery is typical Sutherland, with verges of peat, bog myrtle and flag iris, and heathery moors relieved by outcrops of gneiss. 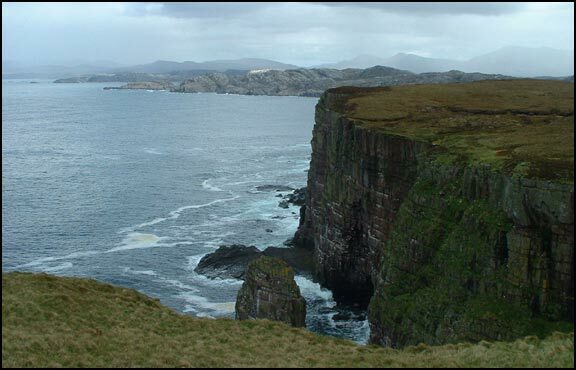 Handa Island is a hidden gem and is a must see for any bird watching enthusiasts on your tours of Scotland! Contact Ireland & Scotland Luxury Tours now to organise your visit.